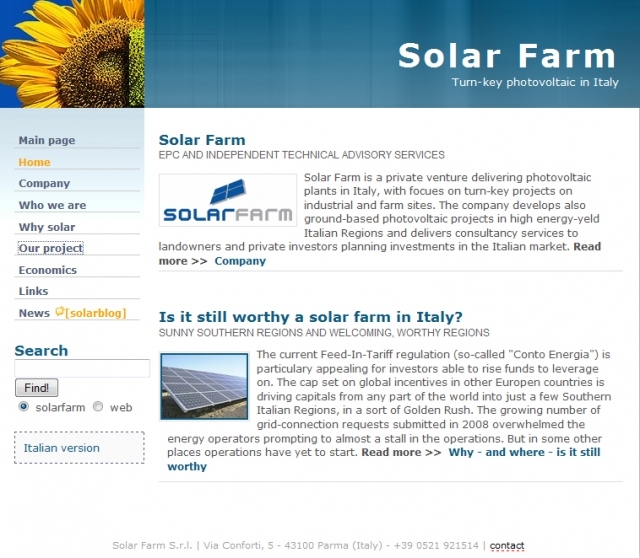 Solar Farm ⁞ Report card: C- ⁞ Here’s my offer to the Parma, Italy-based Solar Farm company, providers of “turn-key photovoltaic in Italy”: If I promise not to install solar paneling, will you promise to stop translating into English? The “Golden Rush” is pretty funny all by itself, but the “focues” and the “high energy-yeld” are just plain embarrassing. Even if you’re a bad translator (especially if you’re a bad translator), you should probably learn to use the spell check. 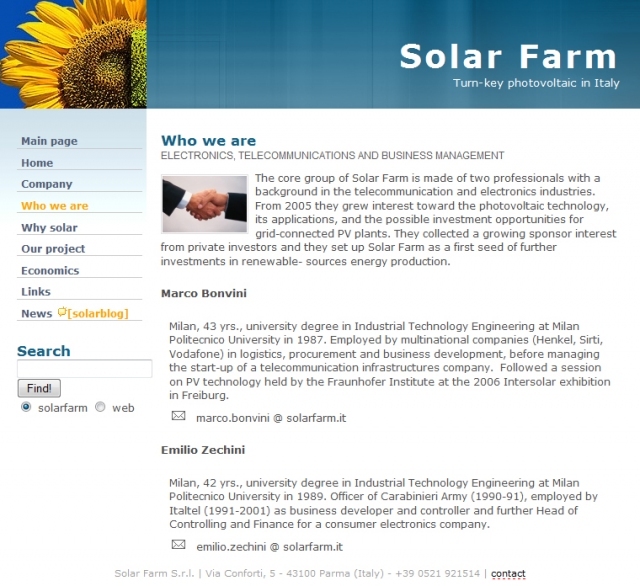 But it’s when we get to brief bios of Solar Farm’s principals, Marco Bonvini and Emilio Zechini, that their site qualifies for the Hall of Shame. I’ll bet both of them are real smart guys, and there’s no question that Italy desperately needs alternative-energy resources. Growing interest toward and collecting sponsor interest ... a full-time job. But what if they think like they write? Or what if the care they put into their consulting services is equal to the amount of attention they paid to the English version of their website? If I were someone interested in solar energy technology, and if I couldn’t read this site in the original Italian, considerations like those would certainly give me pause. In the end, it’s the age-old question: What kind of business are you running if it isn’t worth the price of a decent translation?